At least two popular browser extensions for the Google Chrome web browser have been turned into paid subscription-based services this month, and at least one company, Web of Trust, is experimenting with monetizing their extension as well. This appears to be a trend fueled by Google's Chrome Web Store update to support paid extensions and themes in the store. This is an interesting opportunity for developers who up until now did not really have many options in this regard. If you look over to Mozilla Firefox, donations seem to be the prime source of income if you can call it that for add-on authors. There is obviously nothing wrong with wanting to monetize a browser extension, even though it has not really be done until now in large scale. The two extensions that switched to a paid subscription-based offer on the other hand made several mistakes which turned into negative publicity. So what should you avoid when you plan to release a commercial version of your browser extension? Make the switch without public announcement. Both extensions in question have switched the extension to a commercial offering without informing users about it in advance. The first time users got note of the change was when they were asked to pay money to continue using it. Sell it at an unrealistic price point. Media Hint wants $3.95 per month for the extension, and YouTube Options $1.99 of which half goes to charity. Now, the $1.99 is the lowest tier in the store which explains why the latter may have selected that amount but it is a lot if you ask for monthly payments. Make it subscription-based. The real issue for many users was that the developers wanted the $1.99 per month instead of a one-time payment or once a year payment. Discontinue the free version. Users of the extension can either pay up and use it, or uninstall the extension as they cannot use it anymore. That's recipe for negative store reviews, and that is exactly what happened. Here are a few tips to avoid a publicity disaster. If you plan to monetize your extension, be open about it. Don't just turn on the paid option with the next update, but inform users about it on your website or social accounts. Make sure you provide an explanation for why this is the way to go. Keep offering a free version. By keeping the free version alive, you ensure that you do not get bombarded with negative press and low ratings in the web store. Provide additional features or services for the paid version. You can offer premium support for example, or additional features that are only available to paid users. If you take Media Hint, you could create a custom version that enables services or countries that the free version does not support. Consider one-time payments instead of subscriptions. If your extension is unique, you may have success using a subscription-based payment model. You may also be successful if it is clear to the user that the service has running costs and money needs to come in to cover that. YouTube Options on the other hand is not unique and neither is Media Hint. Both extensions face strong opposition from free extensions, and unless all of those become paid or subscription-based in the near future as well, most users may switch instead. This is new territory for extension developers and companies, and currently limited to the Google Chrome web browser. It is likely that this will turn out to be just fine in the long run, probably similar to how free and paid apps are handled on Google Play. The main problem that developers who want to monetize their extension face right now is that there are free alternatives available. Probably all sorts of reasons why this is unworkable, but… how about some sort of central “tip jar” that gets distributed to the extension developers in proportion to the number of users who have each extension installed & active? [Would require that extensions are able to report back “Hi, I’m installed & active”]. The Mozilla extensions download pages could allow ads. Mozilla & the developer could benefit via ad clicks/views. Obviously popular addons would be paid more this way. Michael, sure there are other ways than requiring a one-time or regular payment. Some add-ons may get sponsorships as you have described under (1), while others may implement tracking or affiliate-based systems such as Superfish. The problem with ads (4) is that there is usually a privacy component to it which is probably the main reason why you won’t see third-party ads on Mozilla owned properties. I agree with you (3) here. I would pay for extensions such as NoScript as well annually or at least one-time to support the dev. Too many sites went overboard with ads, so people started blocking them. 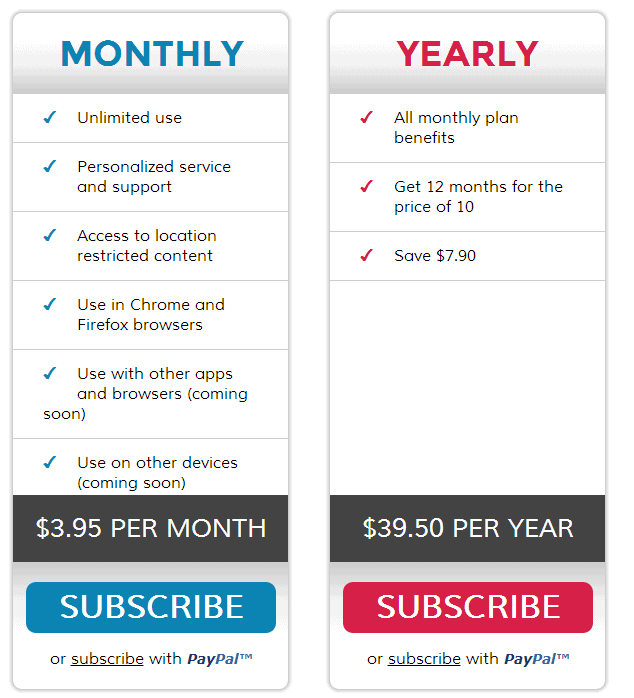 What’s left but paid for subscriptions? Are devs getting inadequate donations or not enough to make them rich? I think it’s some of both. I don’t think you should look at common plug-ins as a large cash stream. But say… $5 for a year, that would be something I would pay. A common plug-in would have hundreds of thousands (if not millions) of users, requiring each of them to pay seems like a large cash stream to me. Devs should be able to charge for their extensions if they can’t make the money elsewhere. In the case of media hint for example, I think they would have been better off looking for something like 1,50$ per month and 12$ per year, or even maybe a once off charge. that should have been sufficient income to keep it going and to not alienate the users, and there were millions of them. I browsed and priced services from vpns to dns servers and found many of them cheaper than 3,95$ per month. they should have advised their users of their plans a month or 2 ahead of going premium. They should not charge more than vpn services per month for an extension that does far less. When it comes to charging for an extension or app you have created, I think you need to 1st… be honest with its users and share future plans for the extension/app. especially if you are going from free to paid. users really appreciate honesty. 2nd you should compare the price you are looking to charge with charges of similar services to make sure what you are charging is fair. 3rd you should not try to tarnish other apps/extensions reputations by spouting lies about them on facebook, twitter and the like. media hint has failed at these 3 things. users are not greedy, and don’t mind paying for good services. here is a list of things i pay per year. all of the above services are invaluable to me, I could not do without them. But what strikes me most is that they offer more, and are all cheaper than media hint per year. ” Media Hint wants $1.99 per month for the extension of which half goes to charity..” since when?? Right, sorry, it is $3.95 as the screenshot highlights as well. WOT always has been a community-powered tool to help others safe the web safer. We highly appreciate all of our active users, as the service would never been in the shape as it is now without them. Therefore, we wanted to assure all the community members who are actively contributing to WOT that the changes described below would NOT affect them. We have reached a point in WOT development where we will start testing a few monetization models. In the following days we will begin testing WOT freemium with users who haven’t contributed to WOT by rating/commenting websites. Under the limited features, there will be one or multiple from the core set of WOT functionality, such as blocking sites, displaying the warning screen, or the reputation icons. Users who have installed the WOT add-on for Chrome and did fulfill above criteria may be asked to pay a fee, or to increase their contribution to continue using the add-on for free. Anyone with an activity score >= 500 (which equals ratings ~20 websites, for example), will be exempt from the freemium experiment. Once again, we will be experimenting with this in near future, and anyone who is contributing to WOT is not included in the experiment. useless.I don’t need ratings from the people who don’t know if site is safe or not. else.Since I am Avast user,I’ll probably use free Avast Online Security add-on,although it has some bugs. These once free extensions that are going paid will be losing a lot of users. I’ve seen this many times. If you are offering a free version, you just don’t stop offering it for a paid version (unless it is very good and have no decent alternatives). Media Hint and Popular Youtube Option is losing users. Even if they take back what they started it would still be flooded by a one star review in Chrome Store. Heck even WoT which is just experimenting has been flooded by one star review and I’ve known some people who removed it. I’ve lurked into their forums after hearing about it and one user even thought that WoT is hacked for demanding him money (lol). Even though it’s an experiment WoT lost a lot of its users. The “Free” internet is dying. I figured that would happen when the push to the cloud began. Subscriptions to use applications, subscriptions to visit websites, pay to view this or that information, yearly fees for forums. None of them ask exhorbitant amounts, so why should I complain? Well, I’m selfish enough to want to continue using the internet, and the cumulative effects of many little charges will put it out of my reach. Don’t I think hard work should be monetarily rewarded? Yes, I absolutely do, and I sympathize with owners of all the websites that Google has devastated and the changing times have affected. I wish I had an answer that would make them rich and myself able to stay online. Someone mentioned ad blocking, and yes I’m guilty of using one. I would remove it in a hot second if something could be done about those damn animated things. They are so distracting to me — and I know it isn’t the same for everybody — that I can’t take in what is on a webpage while one jumps around or flashes. Ad blocking: I feel that advertisers have pretty much poisoned their own environment on that one. Some ads are obnoxious — as mentioned, the Flash or HTML5 animated ads are ugly and loud. Many ads are scams, and a few are frankly illegal hacks meant to load malware on your PC. Banksy once said that hoardings (billboards) are like a stone thrown at your head by some corporation, without your consent. (His advice was to take ownership.) Garrett Hardin, originator of the term “tragedy of the commons”, wrote that while public policy has enforced cleanup of some public commons like airsheds and rivers, other public commons — like view-sheds and soundscapes — are still allowed to be co-opted by private parties for their own profit. If there’s a way to opt out of what I view as exploitation, I’ll take it. Ad-blocking? No guilt. You should also consider LastPass and Xmarks in your thoughts. They are both great services and quite complimentary of each other. Both owned by the same company. They operate on a Freemium model which is good. And there is a discount for getting both on a yearly basic saving some money. Plus access to mobile versions for expanded options when on the go. If extension authors would look at this models I think they would be in a good place with the community. It is the lack of communication before the change that rubs users wrong. I think a 1 month warning should be standard with big changes like this. I don’t think it’s fair that WOT will charge for their extension. The reason being that the websites are actually judged by their USERS who volunteer to rate the sites. The ratings are really not much to be trusted as the users often rate the sites based on their (political, likes or religious etc.) views and often don’t understand that these ratings are supposed to be applied objectively and for safety, rather than emotions. Yes, I do have WOT installed but use it with caution as one cannot really depend on its accuracy. Well, they are currently running a test on Chrome only, and there it is limited to 5000 users. Users who contribute enough (you need to be logged in for that) won’t have to pay. So, currently it is either contribute (more) or pay or live with a limited feature set. Your core products and services aren’t your only way to generate revenue for your business. They may be your bread and butter, but you can create other digital products that help you get more exposure for your brand while also creating an additional income stream. There are other ways which don’t result in injecting ads. I would suggest looking at Extensionify.com which collects anonomys click stream data and doesn’t affect the user experience.